The world’s latest generation commercial airliner, the A350-900, received Type Certification on the 12th November from the US Federal Aviation Administration (FAA) at FAA headquarters in Washington D.C. FAA Associate Administrator for Aviation Safety Peggy Gilligan and Airbus Group Inc. Chairman Allan McArtor were among the signing authorities at the official ceremony. The certified aircraft is powered by Rolls-Royce Trent XWB engines. Today’s milestone follows the A350-900 Type Certification awarded by the European Aviation Safety Agency (EASA) on 30th September. The A350-900’s respective FAA and EASA certification awards come after Airbus successfully finished a stringent program of certification trials which took the A350-900 airframe and systems well beyond their design limits to ensure all airworthiness criteria are fully met. 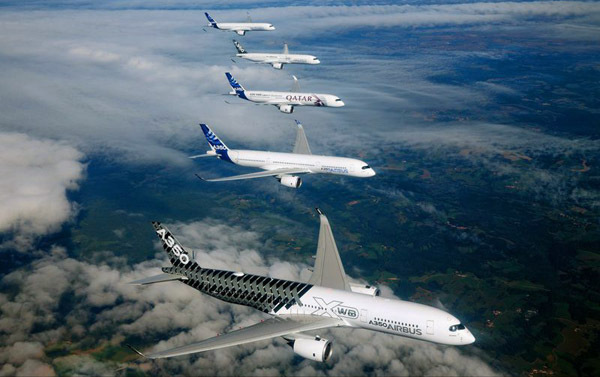 The fleet of five test A350-900 aircraft completed the certification flight test campaign, on time, having accumulated more than 2,600 flight test hours to create and successfully achieve one of the aviation industry’s most thorough and efficient test programs ever developed for a commercial airliner. The A350 XWB is Airbus’ all-new mid-size long range product line and the newest member of Airbus‘ leading widebody family. The A350 XWB stands out in its class thanks to its combination of passenger comfort, technological innovation and its unique industrial process. Built hand-in-hand with our customers, the A350 XWB sets new standards in terms of passenger experience, operational efficiency and cost-effectiveness. At the end of October 2014, the A350 XWB had won 750 orders from 39 customers worldwide. Kommt der Airbus A350 für Ultra-Langstrecken?